We have developed a “Wish List” for the library. 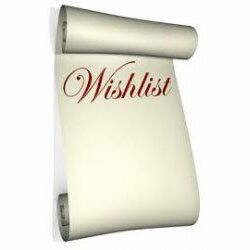 These are items we “wish” we could add to our collection, but just don’t have the funds to do so. If you would like to help, all you need to do is select one or more items from the list. Then fill out the form telling us what you wish to donate along with your information. We will place a bookplate with your name inside the front cover of books and let you know when the item has been processed so that you may be the first to take it out. This is a nice way to honor someone on their birthday, anniversary or in the memory of a loved one.